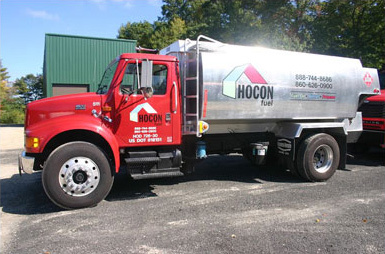 When Hocon delivers your oil, you get the full range of conveniences and protections—including automatic deliveries, service and maintenance, monthly payment options, Auto Pay and equipment installations. And you get them at a guaranteed fair price that will save you big time. We have great employees who will keep you warm no matter how bad conditions get, and we never cut corners on safety. We give you full service when it really counts! Most of our customers are on an automatic delivery schedule. Our computer system tracks how much fuel your home will typically use based on how cold it is outside. We will deliver fuel automatically to you, usually when your tank gets to be one-quarter full. The result: no more tank watching and no more run-outs or calling for a delivery. When your oil tank level reaches the ¼ mark, you should call for more fuel. Most of our customers like the convenience of our automatic delivery service. But if for some reason you prefer to call in your order each time, please be aware that there is an interval between the time you place your order and the time we can actually deliver it. This is because a “will-call” delivery has to be fit into our carefully scheduled routes. Not being part of our automatic delivery program means that you have to take full responsibility for monitoring your tank level at regular intervals. You are also at greater risk for a run-out. TIP: When your oil tank level reaches the one-quarter mark, you should call for more fuel. Hocon offers great options for upgrading your furnace or boiler. We employ only the best, most qualified technicians to ensure that each and every installation is completed to the highest standards every time. All our technicians are knowledgeable, skilled, professional and courteous, and they will do the job right the first time. To ensure that your equipment runs properly and to protect you from repair costs, we also offer service plans. Many of our customers use our monthly payment plan to ease their winter fuel expenses. With the plan, heating costs will always be manageable and predictable. You’ll have one set payment each month for most of the year—and there is no cost to enroll. Many of our customers have already enrolled in this program. You don’t use more heating fuel with the plan. You don’t pay more per gallon. You only pay for the fuel you receive, and there’s no finance charge. If your actual fuel costs are a little higher or lower than we estimated, we will make adjustments as necessary during the course of the winter. Many customers also use our Auto Pay program, because it’s just plain easy. This program, which can be combined with e-billing (when your statements are sent via email), saves you hassle, can help you accumulate points on your credit cards, and makes it less likely that you’ll inadvertently miss a bill in the winter, which could create problems. We can bill your payment directly to your credit card or bank, and you can choose the time of month you want your payment to be charged. Request a fuel delivery today. Note: If you have less than a quarter of a tank of fuel and need a quick delivery, call our office. If you want to become a Hocon Fuel Oil customer, please go here. *State average price is reported weekly by the US Energy Information Administration; oil prices are subject to change on a daily basis.